The Smart Grid is being implemented in countries all around the world. A smart grid is essentially an electrical grid that uses information and communications “smart” technologies to gather and act on information, such as information about the behaviors of suppliers and consumers. The good aspects of the Smart Grid is it improves the efficiency, reliability, economics, and sustainability of the production and distribution of electricity but in my opinion it’s mostly beneficial to the electricity suppliers more than the people. The Smart Grid in combination with the Smart Meter is able to analyze exactly how often you use your electricity and put together a demographic chart to show to electric companies on how they should bill you. (Ex: Decide what times to raise prices on electricity). Smart appliances within the home will be able to communicate to the Smart Meter and send back information to the electrical company.C.I.A in the United States admit they will use the Smart Grid with the combination of Smart technologies to spy on the population. Now and in the future the Smart Grid will essentially be an information gathering control system where “Smart Appliances” (such as smart tv’s that have built in cameras, smart phones, smart washers & dryers, smart fridges, DHS gunshot censors, smart cards and more!) will be hooked up to the Smart Grid. The Smart Grid will be also be a systematic spying device because all the CCTV facial recognition street cameras and intellistreet lights will be hooked up to it as well. Possibly even the announced 30,000 drones to be in American skies for 2020 might also be hooked up to the Smart Grid. Although they are actually talking about transactions of energy I construe this as even our electric transactions such as debit, will also be hooked up to the Smart Grid via “Smart (debit) cards“. 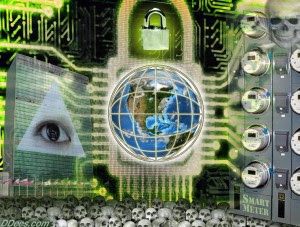 A definite possible scenario according to Aaron Russo the RFID chip implants might be hooked up to the Smart Grid. In the province of Ontario it is the Ontario Energy Board that is implementing and perpetuating the smart grid locally. The Board regulates natural gas and electricity utilities in the province of Ontario. This includes setting rates, and licensing all participants in the electricity sector including the Independent Electricity System Operator (IESO), generators, transmitters, distributors, wholesalers and electricity retailers, as well as natural gas marketers who sell to low volume customers. The Board oversees the electricity market and ensures regulated gas and electricity monopoly utilities comply with Board decisions and orders. Smart Meter Entity means the entity that collects and compiles Smart Meter data. The Smart Meter Entity for Ontario is the Idenpendent Electricity System Operator (IESO).IBM has made a 5-year $68.5 million contract with IESO. Under the agreement, IBM will enhance the overall performance of the system through new computing infrastructure, enhanced web services facility to support increasing volumes of requests for consumption information, enhanced disaster recovery capabilities, and operational improvements with a focus on reducing risk and costs. The first computers ever built, where built by IBM for eugenics. (the Jamaican race study and the Nazi punch card systems) and IBM is the company that has been running commercials promoting RFID microchip implants to perpetuate the cashless society. In Canada the Royal Canadian MINT is perpetuating the cashless society, they have a vision to eliminate all paper and coinage currency. The United Nations openly admits they want establish a one world government and one world banking system under U.N control. Canada is signatory to the U.N. In 1992 in Rio de Janerio, Brazil, Agenda 21 was created by the U.N which is an implemented action plan with regard to sustainable development. It is an action agenda for the UN, other multilateral organizations, and individual governments around the world that can be executed at local, national, and global levels. It is a product of the UN Conference on Environment and Development (UNCED). Agenda 21 is a plan that they want to accomplish by the end of the 21st century. - Wildlands Project tells how most of the land is to be set aside for non-humans, meaning “NO HUMAN ZONES”. For more info on U.N Agenda 21 from U.N website Click HERE. Our country is being taken over by “sustainable development” under an environmental guise to mask a stealth takeover by bankers imposing a control grid upon the population. Canada and the world are being enslaved by Smart Technologies.